Board Game Saturday on Wells 21 January 2012 | Action Points! First order of business was Innovation, with just 3 players as we waited for the rest to turn up. Jin Wei had strong early cards which served him well even into the late game, but was lacking diversity early which left him vulnerable to demands. At one point, Jon and I managed to completely deplete his Score pile of 20+ points. However, the early lead let him snag the Achievements for Age 1, 2, 3 and 4 quickly. At that point Jon had built an impressive tableau with many splayed cards but was low on scoring Dogmas before then. He had a few good scoring turns and managed to claim 3 Age Achievements. Similarly, I also managed to build a decent tableau toward the late game and managed to score 3 Age Achievements as well. I was thwarted many times due to my relative lack of Coin and Leaf icons. I was also constantly denied the 2 Future icons I needed to claim the Empire Achievement, and later on got my 3rd Leaf icon removed (I think it was stolen, but it might have been sent to my score pile) which set me back even more. This becomes important later (Ooooo… Foreshadowing…). With all the Age Achievements claimed, it was down to the Special Achievements and we were each trying to claim different ones. Finally, Jin Wei claimed the win by playing and activating Bioengineering. Even though Jin Wei had a commanding start, it was a good tense game toward the end. My only regret (and Jon’s, I’m sure. Even though he capitalized on that fact various times in the game) is my civilization’s lack of environmental concern! After a pizza break and the arrival of more players, the next game I played was Penny Arcade the Game: Gamers vs. Evil. This is another deck building game, this time from Cryptozoic Entertainment based on Penny Arcade’s IP. I am quite a fan of Penny Arcade, so I couldn’t resist getting this game even though I’m starting to grow weary of deck building games. The game stays fairly true to the familiar Dominion formula, with some elements of Ascension thrown in. You buy cards to add to your deck, a la Dominion, but you are not limited to the number of actions or buys you can execute in a turn, like Ascension. Also, there are two distinct resources (Tokens and Power) like Ascension. Red cards you gain with Power are worth victory points at the end of the game, but otherwise function similarly to Green cards. The other additions to the formula are asymmetrical starting positions with unique characters and character powers for each player that changes the starting makeup of your deck and also provide additional benefits. The other difference are the Red and Green Bosses. They function similar to Provinces in Dominion, in that they are the most expensive cards, are more valuable, and end the game when either Boss pile runs out. The main difference is that each Boss card (Loot) also has a unique power in addition to the Victory Point value. The game description sounds like I am not very happy with the game, and yes I do admit a certain weariness with Dominion style implementations of the deck building genre, but I really enjoyed the Penny Arcade game. The main factor is the flavor on the cards. There is no real narrative theme to the game, except maybe defeating the Bosses, but even that is fairly thin. However, the art and names of the cards are based on Penny Arcade characters and elements which I enjoy immensely. The humor can be pretty crude at times, but once in a while you just want to play a card called “Touchweiners” and whine about how no one wants to “Touchwieners” with you. No other game on my shelf now allows someone to complain about never having more than a single “Scrotuum” at a time. While we were playing the Penny Arcade game, the other group played Infinite City. Endgame may have become awkward after I pointed out a red piece that had fallen off the board, but it looks like Heng Lin was up to his usual devious tricks again. Next, I joined the group playing Prolix while the other group busted out Kingsburg. Prolix is a word game where you make words based on 8 tiles available to you on your turn. The tiles only contain consonants, and as such you are free to add any other letters you wish to create your word. For example, if the 8 tiles were W,F,F,L,T,B,D and D, you can claim WAFFLE as your word. You then score the point values for W,F,F and L. If you had claimed WHIFFED, you would score W,F,F and one of the Ds. After each turn the tiles are slid down the track and new tiles are added, which results in tiles becoming less valuable as the turns progress. So far it’s still fairly straightforward. The interesting mechanic is the ability to interrupt another person’s turn. If you take too long to come up with a word, someone else can interrupt you and claim a word using your letters. They then score that word as an Interrupt, which incurs a slight points penalty. The tiles are then advanced, but you may still continue with your turn with the new letters. However, if you are interrupted again, your turn is over and you score no points that turn. The game lasts a set number of rounds, and you total up the scores for all your words including Interrupts at the end of the game. The catch is, you need to delete a number of fully scored words equal to the number of Interrupts that you’ve claimed (or one less than the number of Interrupts in a 4-5 player game, letting you score an additional Interrupt which means you should Interrupt at least once in a 4-5 player game). As such, you should always weigh the benefits of Interrupting as it may end up lowering your final score if your Interrupts do not score at least as much as a regular word on your own turn. I really enjoyed Prolix, and I see it being a good filler between heavier games. I do not have many word games in my collection, but this one is very welcome. The freedom to use any other letter freely encourages use of long words to maximise scoring potential, and is something quite refreshing compared to other word games that restrict you to letter tiles. The Interrupt mechanic is a clever little balancer to make sure turns don’t take too long, without implementing a timer, although a timer and rules for its use are also included. I also like how you have to quickly assess whether it is worth Interrupting to score something better than what you have already scored. Definitely a game that will be played more often, as it is quick and easy to grasp. The final game(s) of the evening were two sessions of Discworld: Ankh-Morpork, while the other group were still on . Vong finally managed to play Kingsburg with the correct rules, and he managed to win the game as well. 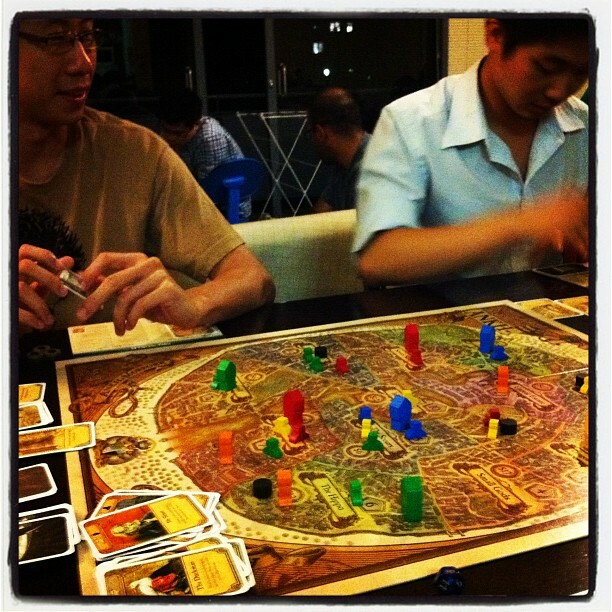 It seems like Jin Wei has become enamored with Discworld: Ankh Morpork and they have played it multiple times while I was away. The first game of Ankh-Morpork was a bit of a fiasco on my part. I stupidly miscounted the number of Trouble markers on the board and added a minion, creating the eight trouble marker. The other 2 players couldn’t do anything about it, which allowed Jon to win the game as Dragon-King-of-Arms. Chen Siang was new to the game, and there were a few humorous moments when he revealed information about his plays due to the phrasing of his questions. The first game had ended fairly quickly, and Kingsburg was still going strong, so we decided to play a second. The second game was much more exciting and entertaining, with Chen Siang orchestrating the highlights of the game. Early in the game, Jon managed to secure a building in Seven Sleepers by “extorting” Chen Siang with Dr. Whiteface. On his turn, Chen Siang retorted by burning it down with the Fire Brigade. This elicited howls of laughter from Jin Wei and I. Jon vowed to reclaim Seven Sleepers, and managed to by using multiple loans. He managed to keep it for longer this time, but eventually Chen Siang bought over the building with Reacher Gilt, causing much amusement to all except Jon. The Lady was also smiling upon Chen Siang that night. He played two wizards in a turn, and both random events benefited him greatly. The first Dragon let him obliterate Jon and I from Longwall, which allowed him to later move in and build. The Demons event saw him rolling a 2 and three 7s to pile Demons onto areas which did not contain any of his pieces as well as making it near impossible for us to reclaim The Shades. He also managed to maintain a hand of 10 cards for several turns with his cards and when he started counting them for discards to the Shonky Shop, we suspected he was Chrysoprase. His card drawing was helping Jin Wei, as Commander Vimes, too though and Jin Wei would have won on his next turn if Chen Siang hadn’t. Nevertheless, we could not put a big enough dent in his financial portfolio and Chen Siang was victorious as Chrysoprase. Another small moment that made me geek out in joy was when Jon played both Moist von Lipwig and Adora Belle Dearheart back to back. All in all, an extremely entertaining and enjoyable games night. 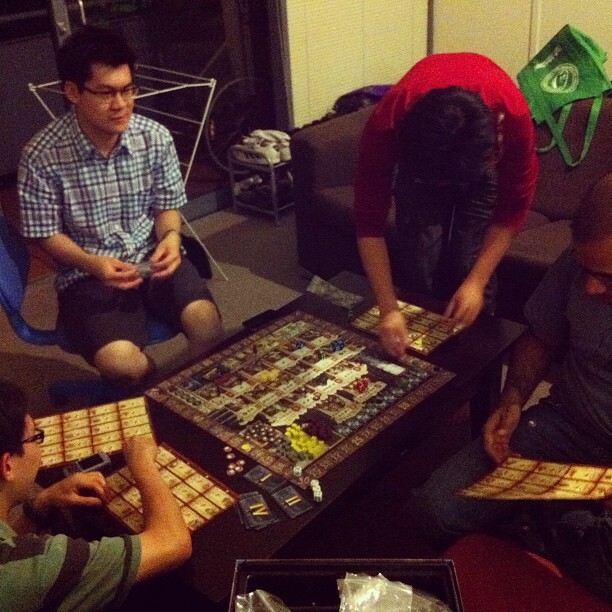 I’m glad to be back in Melbourne and I am looking forward to many more fun game nights this year.